Concerned about BPA? We are too! Presently, there is no such thing as a BPA-free can unless it has no enamel liner whatsoever (which would make it susceptible to corrosion). So even our cans, like ALL cans in the industry, contain BPA in the inner enamel lining. 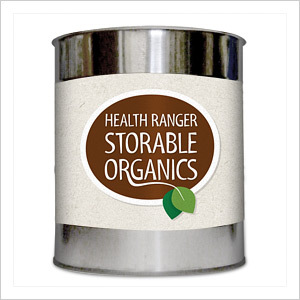 However, the difference here at StorableOrganics.com is that we put the food and superfood products inside BPA-free, thick-walled re-sealable bags. These bags are then placed inside the can so that your food never comes into contact with the BPA enamel. In addition, we add oxygen absorbers and moisture absorbers into the can, and then we seal the can using an industrial-grade food seamer machine that creates an air-tight, steel-rimmed, mouse-proof seal. Remember: Mice can eat right through plastic, even thick plastic! Food stored in plastic is not truly long-term storable. Glass containers can easily break. Only steel cans provide the long-term storability, durability and reliability you need for preparedness. As soon as the can industry provides a BPA-free source for the inner can enamel, we will of course immediately switch over to BPA-free cans. Until then, we are using this double layer of protection to make sure your food never comes into contact with the BPA enamel. Always store your food in a cool, dry environment to extend life. Refrigeration will roughly double the lifespan of most stored foods. Storing in a cool root cellar is also a good strategy. Do not store foods in a hot garage. This will roughly half the storable shelf life of foods.